After a week of pumping surf in Haleiwa, Joel Parkinson finishes on top, claiming another Hawaiian Pro title. Check out the final day highlights! Vans Triple Crown of Surfing is going down on the North Shore of Oahu, Hawaii November 12 – December 20. After a week of pumping surf in Haleiwa, Joel Parkinson finishes on top, claiming another Hawaiian Pro title. Check out the final day highlights! Vans Triple Crown of Surfing is going down on the North Shore of Oahu, Hawaii November 12 – December 20. Vans Triple Crown of Surfing series returns to the North Shore of Oahu, November 12 through December 20, and will celebrate 36 successive years of professional surfing, grounded by its commitment to community, surf culture, art and environmental sustainability. The first stage of the series — the Hawaiian Pro — launches November 12 at Haleiwa Ali'i Beach Park. The esteemed reputation of the Vans Triple Crown of Surfing (VTCS) has evolved over time, shaped by generations of surfing heroes who have left their mark throughout the years on the most challenging and wave-abundant coastline the world has to offer. In a story of personal challenge, physical prowess and proven performance in diverse conditions, the VTCS is the ultimate test of a surfer. 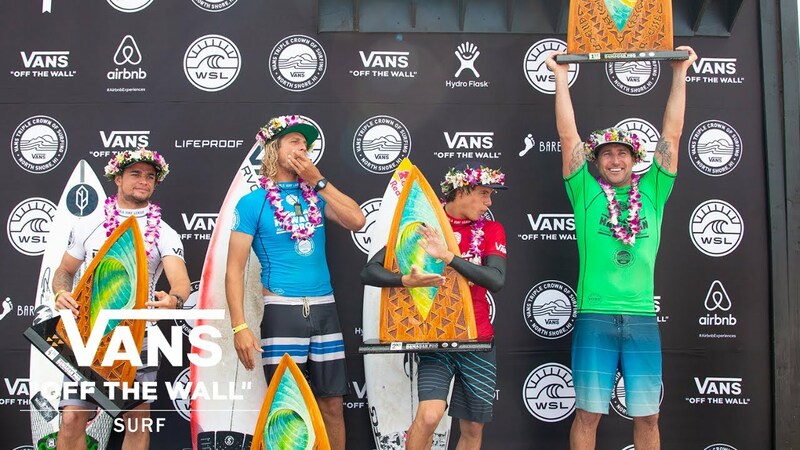 This specialty series includes the final stop of the World Surf League (WSL) Men’s Championship Tour (CT) — the 48th Annual Billabong Pipe Masters — as well as top-rated WSL Men’s Qualifying Series (QS) competitions. The VTCS features three equally storied and prestigious events: the 34th Annual Hawaiian Pro (November 12 - 24, Haleiwa Ali‘i Beach Park); the 44th Annual Vans World Cup of Surfing (November 25 - December 6, Sunset Beach); and the Billabong Pipe Masters (December 8 - 20, Ehukai Beach Park). Presenting a six-week showcase of the sport and the industry, the VTCS is the most sustained window into surfing anywhere in the world. The series ultimately sees the top performing competitive surfer of the North Shore’s esteemed big wave winter season awarded as the VTCS Champion, alongside the crowning of the WSL Men’s World Champion. The VTCS also awards promising rookie talents, individual event winners and qualifiers for the 2019 CT. Kicking off today, the Hawaiian Pro is a WSL Men’s QS 10,000 event and second to last opportunity for athletes to qualify onto the 2019 WSL Championship Tour. Surfers on the bubble will be fighting the 128-man field for a place atop the podium at this event. The Hawaiian Pro heats up the QS competition while also igniting the VTCS title race, with an emphasis on welcoming international athletes, media and fans to Haleiwa, the gateway to Oahu’s North Shore. In sync with the competition, the WSL and Vans are also curating an exciting lineup of events in the community including outdoor movie screenings, a Skate Jam at Banzai Skate Park, Talk Story panels with athletes, Duct Tape Festival activations and more. As a brand rooted in people, culture and community, Vans has successfully honored the surfing’s history as well as its modern-day champions, but more importantly, it celebrates Hawai‘i – the birthplace of surfing – as the inspired North Shore community who make this series so special. Each event of the 2018 Vans Triple Crown of Surfing will run on the four best days of surf within the event's holding window. LIVE streaming is available on WorldSurfLeague.com, VansTripleCrownOfSurfing.com, Facebook.com/wsllive and the WSL and Facebook apps (Facebook login required for mobile viewing). Or tune into Spectrum SURF Channel, which will televise the action LIVE and in replay on digital channels 20 and 1020HD, across the state of Hawaii. A complete list of community events open to the public can be found at VansTripleCrownOfSurfing.com.